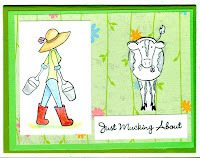 I have been anticipating the release of Scrap and Stamp Arts April 2008 issure for a while now. I’m pretty sure my “Never Ending Card” will be published in this issue. 1. Cut 3” X 6” pieces card stock. 2. Score at 1 ½” from both ends and fold toward the middle. 3. Crease these two pieces thoroughly, unfold and re-crease from the opposite side. 4. Place two pieces horizontally on work surface. 6. Carefully adhere the common corners of all four sides, use the strong embossing tape. 7. Card construction is now complete. 8. Be mindful to plan the placement of the stamped images or photos before actually putting them in place, because the opening of the card reveals another area. It is very important to plan carefully! • Ten 1 ¼” X 2 ¾” pieces of light blue card stock. • Twelve 1 ¼” square pieces of light blue card stock. 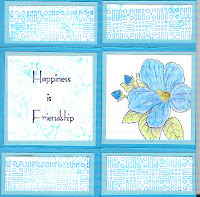 • Six 2 ¾” square pieces of light teal card stock. 1. 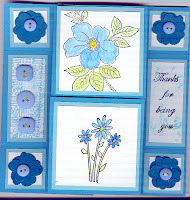 Stamp and color border and flower images. 2. To create texture, crumple up a piece of paper, dab into light lavender ink and then apply to the paper. 1. Stamp and Color flowers as shown. 2. 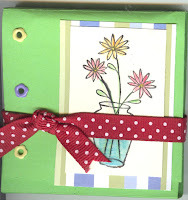 Cut out sizzix flowers and apply to card front, embellish with glitter. 1. Stamp images from valentine plate and adhere. 2. Stamp tulip over border and adhere, cover with crystal lacquer and let dry. 3. Stamp sentiment and adhere. 4. Apply sizzix flowers and adhere, embellish images with glitter. 1. Stamp images and Color, apply crystal lacquer to tulips and embellish the flower with glitter. Complete instructions for this may be viewed on the web at www.hgtv.com it was featured on the Carol Duval Show, Episode CDS-1452. This is my version of the card using the Sparkle N Sprinkle designs. 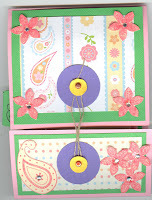 What a treat to learn how to make this intersection mini album. Special Thanks to Linda Heller at for her inspirational and instruction on how to make this innovative project. I am a big fan of ‘see it stamp it’ and usually employ this technique when I am teaching classes. To view more pictures of this project, please visit my picture trail gallery at www.picturetrail.com/ms.rhetta. My Favorite Things stamps, this is a new set of stamps I bought directly from the websight, for those of you who are interested in their stamps/products, please check out my main blog page for the link. I used Staz On Black ink to stamp the images and water color pencils and a blending pen to color them. The girls boots are watercolred and then coated with a light coat of Diamond Glaze and then glitter is added for a glittery slick effect. This is a standard card and measures 4 1/4″ X 5 1/2″. As always, please do not hesitate to email me at: ms.rhetta@verizon.net with any questions or comments. Current swaps; Valentine Swap, make 5 identical valentine cards get 5 back, sing up from now until Jan 16. Cards are due in my hands no later than Jan 28th, please send them in a zip type baggie inside of a SASE with same amount of postage you mailed them with plus an additional stamp (if the extra postage is not used it will be returned). The best swap will receive a prize! What ever stamps/company embellishment, etc., you want to use for the swaps are fine. Please email me to sign up and receive my snail mail information. All Swaps will be scanned and uploaded to my picturetrail sight. She was 42 on Dec 30. Little did I know that when I saw her on the 29th, it would be the last day I would ever get to see her. Her name is Barbara and she was my younger sister. It appears a life not well spent ended due to an accidental overdose of prescription pain medications and possibly meth. Tragic, sad, sorrowful. In many ways my life will never be the same. She left behind so much, she had such potential that was never realized. She left behind a precious 11 year old daughter whom is staying now with my mother. My prayer is that with my mothers advancing age (73) she will see her way into having this precious child live with my husband and I. She also has potential. I am finally finding time to stamp today. I will post some of my creations later on today. 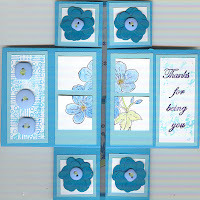 I am hoping to get alot of ‘Thank you’ cards out. There are alot of people in Augusta, Georgia who are supporting my mother and niece during this difficult time. It is really hard right now to try and have a ‘normal’ life here in Maryland. Keep our family in your thoughts and prayers. Hello every one in Blog Ville! Isn’t this a cute mini card? 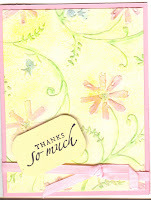 I was inspired today by a small card I viewed on stamping school. (www.stampingschool.com) that measured 3 1/2 X 10″, this card is a 3 1/2″ square. 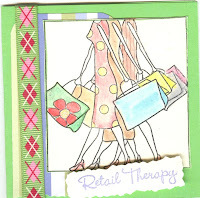 I used the shopping ladies from “My favorite Things” stamps to create the card front with the sentiment ‘retail therapy’. For this image I choose Staz on ink and used my water color pencils and a blending pen to color. I also added a little glits with glitter. I love shopping. 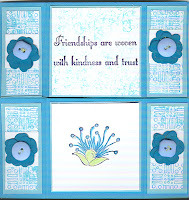 I just made a huge Stampin Up order as well, so I’ll be set in stamps for a long time. I can hardly wait to get them all ‘inky’! This is a quick and easy project. A while back I was able to pick up small sewing kits on the clearance at Joann’s. They come in tiny plastic boxes and I simply used super sticky red tape to attach them inside. I stamped the image and embellished it with crystal effects. For added glitz, a few well placed eyelets and ribbon complete the kit. It is actually held together using a velcrow type closure. I hope every one had a nice Christmas! Our’s was wonderful, it was just nice to spend the day as a family and enjoy the celebration of the true gift of Christmas, The birth of our Lord and Savior Jesus.